Country music group Lady Antebellum emerged big winners, taking home five trophies at the 53rd Grammy Awards while biggies like Lady Gaga and Eminem followed close with three and two golden gramophones respectively. 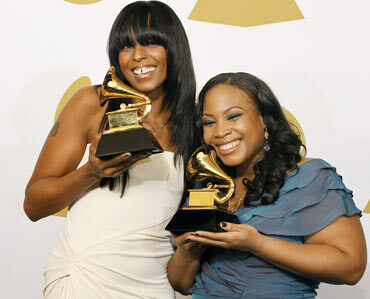 Antebellum's 'Need You Now' won the Record of the Year and Best Country Album Grammys, while the title track bagged the Song Of The Year, Best Country Performance By A Duo Or Group With Vocals and Best Country Song awards at Sunday night's ceremony held at the Staples Centre in Los Angeles. Pop diva Lady Gaga, who arrived at the red carpet in a giant eggshell, took home the Best Short Form Music Video and Best Female Pop Vocal Performance for 'Bad Romance', while her 'The Fame Monster' was name the Best Pop Vocal Album. Though hip hop star Eminem was nominated in 10 major categories, he managed to win only two Grammys -- Best Rap Solo Performance Grammy for 'Not Afraid' and Best Rap Album for 'Recovery'. Jay-Z and Alicia Keys' hit collaboration 'Empire State of Mind' won two gongs -- Best Rap/Sung Collaboration and Best Rap Song. Jay-Z, 41, also took the Best Rap Performance by a Duo or Group statue for 'On To the Next One', a dual effort with Keys' husband, Swizz Beats, the New York Daily News reported. Arcade Fire's 'The Suburbs' grabbed the Album of the Year Grammy, beating Eminem's 'Recovery', Lady Antebellum's 'Need You Now', Gaga's 'The Fame Monster' and Katy Perry's 'Teenage Dream'. Esperanza Spalding pipped Justin Bieber, Drake, Florence & The Machine and Mumford & Sons to be named the Best New Artist. 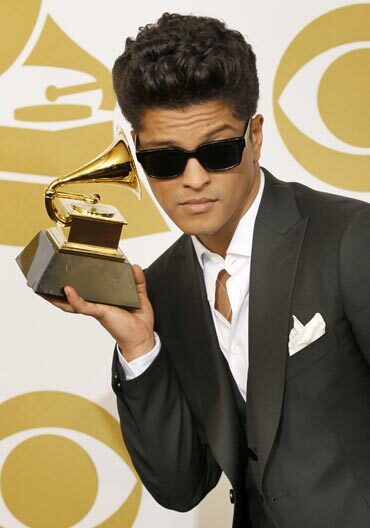 Bruno Mars won the Best Male Pop Vocal Performance for 'Just The Way You Are', beating heavyweights like Michael Jackson, Michael Buble, Adam Lambert and John Mayer. Beatles legend Paul McCartney won the Best Solo Rock Vocal Performance for 'Helter Skelter', while Keith Urban won the Best Male Country Vocal Performance for 'Til Summer Comes Around'. 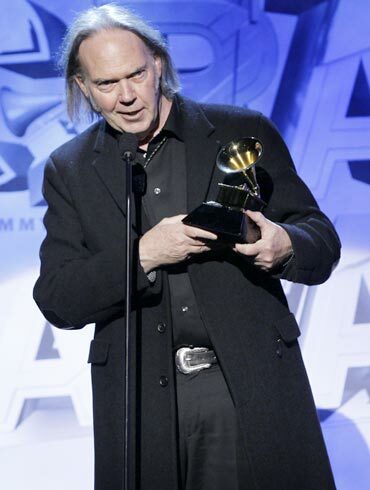 Rock legend Neil Young received his very first Grammy for music on Sunday night. He won Best Rock Song for 'Angry World'. 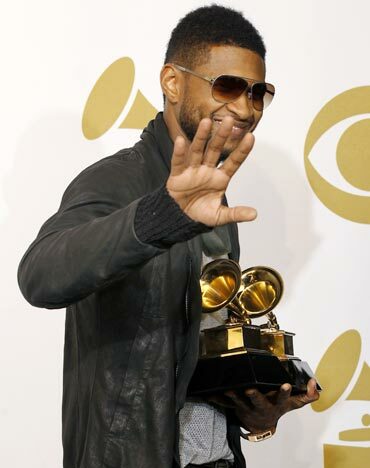 Rap superstar Usher's 'Raymond V Raymond' was named the Best Contemporary R&B Album, as Rihanna took home the Best Dance Recording gong for her 'Only Girl (In The World)'. The Best Traditional Pop Vocal Album Grammy went to Michael Buble's 'Crazy Love'. Blues-rock duo The Black Keys won Best Alternative Album, and classic-rock guitarist Jeff Beck won Best Pop Instrumental for his six-string interpretation of the opera classic 'Nessum Dorma' and Best Rock Instrumental Performance for his album 'Hammerhead'. The already Oscar-endorsed music for the film 'Crazy Hearts' won Best Compilation Soundtrack Album and Best Song Written for TV or a Movie, with the latter being for Ryan Bingham's husky piece 'The Weary Kind'. 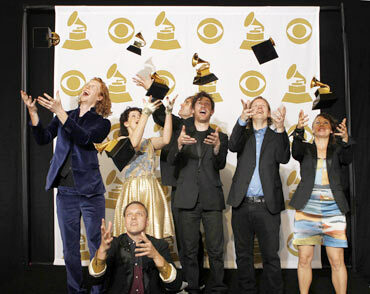 Another first, 'Baba Yetu', became the first piece of music written for a video game ever to win a Grammy. It got Best Instrumental Arrangement Accompanying Vocals. Pix: Lady Gaga hatches from an egg!